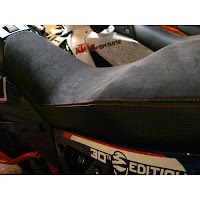 KTMtwins.com KTM Motorcycle and Product News: Sweetest 950/990 Adventure Seat for the money back in stock! Sweetest 950/990 Adventure Seat for the money back in stock! It's nice and your bike is worth it. Hard to keep in stock because it has to be ordered straight from Austria. It's now back in stock. KTM's 20TH Anniversary Suede 950/990 Adventure Seat is here!